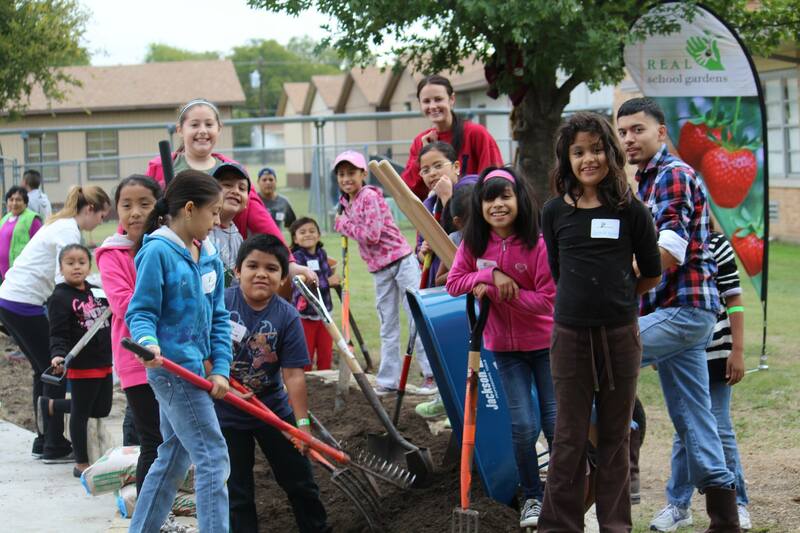 Students and volunteers come together to help at Kiest Elementary’s Big Dig in October, 2013. REAL School Gardens is a nonprofit organization that works to “create learning gardens that grow successful students.” In order to do so, teachers, parents, businesses, and students come together to design a learning garden. These gardens are created in low-income schools, where teachers use them to improve academic achievement and student engagement. REAL School Gardens trains the teachers on how to use the garden in their curriculum year round. The organization provides certified educators on-site for one-on-one training with teachers during class. Teachers are given three years of training in order to become proficient in using the gardens to teach several academic subjects. Teachers are also given ready-to-use lesson plans, which make incorporating the garden simple and fun. “The garden reaches across all subject areas. You can use it to teach math with perimeter and areas, you can use it to teach science. We have seen the results when children learn through hands-on activities, their overall knowledge and test scores increase,” explains Silverman Terreros, a third Grade Bi-lingual Instructor. The unique aspect of this program is that it allows students to be involved throughout the entire process, from planning, to creating, and growing the garden. Not only does this help students in school now, but it gives them the tools they need in the future to build their own garden! The process starts off with a design competition at each partner school. This allows students to apply real-world math skills, use critical thinking, and practice collaboration with other students. Once the design has been created, it’s time for “The Big Dig”. This is when everyone comes together to create the garden. Students are asked to follow instructions and calculate areas and volumes, which allows them to build their engineering skills. More than 40% of children in the United States attend schools that simply don’t have the resources or money to help students as much as they need to succeed. Students from low-income families begin falling further behind throughout elementary school. This is why REAL School Gardens does what they do. Schools using this program have seen a 12-15% increase in standardized test scores and an increase in science scores as well. This program has been proven to create more effective teachers, as well as engage students in subjects they may have once overlooked. Looking to donate, learn more, or help out? Visit the REAL School Gardens website.